You can get more information about Vasota here. Details about the trek were distributed by my colleague who received it from Prasad Mane. Another good experience from the trip was the stay at Ambawade - a village nearby which is connected by water route. Our stay was arranged by one of the organizer who was a resident of the same village. They give us traditional Maharashtrian food prepared in the village(very spicy). C-Coding Guidelines for making embedded systems safe. - Availability: For most of controllers, C is only efficient programming language available other than assembly language. - Support for low level operations. -Availability of optimizing compilers which produces faster, smaller and less RAM efficient codes. - Requirement for portable code due to changing environment and market competition. - Availability of auto code tools and open systems etc. - Assembly language will not be suitable for critical applications since the possibility of bug getting introduced and testing efforts are very high. - Program not compiles as programmer expects. - Logical/Runtime errors in program. So we should be very careful in wring C-programs for safety critical embedded systems. Since C is highly matured and long been in use, lot of possible mistakes are known and also there are tools are available for the analysis of C code. So if we are coding in a constrained way keeping the guidelies collected from experienced programmers, then we can avoid most of the bugs and their by reduce the debugging efforts and time to market. ISO 9001/ISO 90003/TicKIT, MISRA, MIL, ANSI etc. Tools can be used for the static analysis of the code written. Do not rely upon implementation defined behaviors. If using any implementation defined features, Then use with proper documentation and care. Keep a note on the character set and encodings supported by the compiler. Avoid using same variables names for variables in the inner scope of a block and outer scope of a block. Avoid reuse of variable names across modules. Use prototype declarations for functions which are visible at both the function and call. Data type of variables or functions which are declared in multiple locations should be compatible. Do not comment out code sections - Use #if, #ifdef etc. Because effect of comments inside the commented section of the code will be unexpected. eg:- Use bitfields only to keep shorter data variables to reduce the memory usage. Do not mix scope and linkages of variables. eg:- identifier name with internal linkage in one file and the same identifier name with external linkage in another file will cause confusion. Restrict the scope of object or function only to the required module. (This will avoid accidental use of objects/functions by other modules). When I bought an android mobile, most irritating thing which I found was the battery life. I have tried lot of applications to increase the battery life. Most of those applictions were scheculing applications which switches on/off the power modules. There were some applications which contains a task manger also which will kill applications running in the backgound. Another technique was to underclock the mobile when it is in idle mode(needs to be a rooted phone). Most of these cases will be somewhat difficult for someone who is not so familiar in gadgets. What I have noticed is, main reason for the battery running out of juice is due to the mobile data connection. If we are enabling and disabling the mobile data connection whenever required, then it is going to make a lot of difference(it helped me to improve battery life by around 4-6times). Disabling mobile data does not just means disabling of background data. But nobody wants to always go to the settings menu and disable or enable mobile dat frequently. In this case we can use some simple application which provides a widget to enable and disable the mobile data. Toggle Data Widget, Data Enabler Widget are two application which I found while searching on android market which are free. After installing these application, go to the home screen and do long press. Now a menu will appear. From the menu select widget. Now another menu will popup, from this menu seleect the app name which was installed. Now it will appear in the home screen as a button. Click it to enable/disable data whenever necessary. Another option is to add the power widget to enable/disble WiFi, GPS. 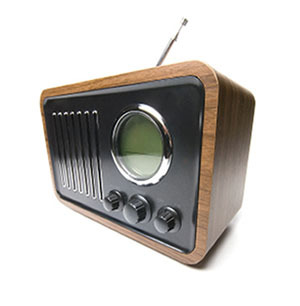 Here is my list of Hindi radio stations with embedded player and links to the stations. Select the option button to start playing the corresponding station. You can copy the link in the second column and play the staion with windows media player. Some staions will take some time to start playing depending on the connection speed. If is not playing then, the staion might be offline. Perl is a widely used scripting language. It is one of my favourate language, because it helps me to do lot of time consuming tasks in less than a few seconds. The regular expressions feature in perl and the shorcuts helps me to write scripts quickly. It is even possible to write script for some purpose in few minutes which might take hours or days to do with C-programming language. I uses perl for automating and processing while I do coding in embedded C.
Getting perl is very easy, we can get the package for windows, linux, mac etc from the website install. Or we can the source code from download page and compile it. One problem with the binary packages available from perl download page is, it contains lot of modules and the perl.exe itself cannot be used to run(actual perl will be present in a dll). That is we should have the entire package to run the perl. So I thought of getting a perl interpreter which is available in a single exe. So I got the source code for perl from the download page and found there is an option build static-perl which when compiled will give an exe file called perl-static.exe. This perl exe file can be used standalone and contains the libraries also. Many times we want to remove comments from a C-Program, may be for extracting some information from the code or some other code instrumentation. This is a handy Perl code snippet which I found from this forum. This script will remove both C style comments /**/ and C++ comments //. Another advantage of this script is that, it will not remove /* ... */ which comes inside the double quotes like "This is /* a */string". This is acheived with the help of conditional operations in perl regular expressions(regexp). Here regular expression is used with "e" extented switch, inorder to put comments and spaces in between the regular expression. This makes it readable. Bootloader is a small utility program which can be added on to flash microcontrollers. It helps us to download code to the microcontroller whenever we need without using a flash programmer hardware and without taking out the chip from the target board/device. But what if we have found some bug in the bootloader itself and want to reprogram the bootloader ? But what about embedded systems in which controller is not accessable and the only option is reprogramming itself using the bootloader ? Microcontroller has capability to execute code from RAM. Microcontrollerhas hardware capability to swap the boot blocks(Process called as boot swapping). In a simple bootloader example shown above, bootloader is present in the region 0 to 0x1000. So this region will not be changed during reprogramming. A flash programmer/ISP etc is used to download Bootloader (or Bootloader + initial application) code to the microcontroller. Normaly bootloader passess conltorl goes to the application. Whenever there is a command to reprogram, program flow control goes to the bootloader. Bootloader starts receiving the new Application code from the remote unit using one of the communication medium(CAN, LIN, SPI, RS232, USB etc). Bootloader verifies whether the data is completely written without any errors, and finilizes the reprogramming/reflashing. I will explain this with the help of the microcontroller v850 series microcontroller from Renesas. Flash memory is divided in to smaller blocks, which can be individually erased as shown in the figure above. Block 0 can be swapped with Block 2 and Block 1 can be swapped with Block 3. This will help in reprogramming the entire flash memorey(including bootloader) without any risk of dumbing the chip. A) Always the entire flash memory is reflashed. In this cas there will not be seperate bootloader/application. So download is done in two stages. Also it is ensured that the code for downloading and the dependencies are present in the lower two bocks. Steps involved will be. Starts after receiving the command for downloading. Actual execution of the code which reprogramms will be copied to the RAM and executin will jump to the code in RAM. For this purpose, code is compiled such that it can run from any location(Position independent code - PIC). Downloads and writes the lower two blocks(0 & 1) of code in the blocks (1 & 2). Verifies whether two blocks are written without any error using CRC/checksum. New code starts and continues downloading the rest of the code. Download is verified and finalised. B) Simple architecture is followed, special code with bootloader(Bootswapper) will be downloaded to update the bootloader. In this case bootloader will work same as that of the simple bootloader. But if we want to update the bootlaoder, then we can download a special code (say Bootswapper). This special code will contain the code for the new boot loader which is offsetted to some other adderss. 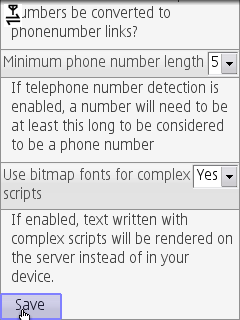 After complete download, bootloader will pass the control to the application(here the special code - bootswapper). Now this special code will execute from RAM and copy the address offseted new bootloader to the bock 2 and 3. After that it will swap the blocks to have the new bootloader in the blocks 0 and 1. In this post I will show how to do settings for Opera Mini browser so that, Tamil web pages can be viewed using a mobile phone. This method will work for all mobile phones with java support. But before starting, if you are using android mobile, then there is a browser availabe from Mr. Dhanika which can render unicode tamil and simhala languages. This setting for Opera Mini is same as my previous post. But here I have added some of the screen shots related to viewing tamil pages. Before starting, this is how a tamil unicode page looks, if you are trying to open a Tamil page without doing the setting. First step is to type the address bar "about:config" and press go. Now this will show a menu called "Power-User Settings" where some settings related to loading of pages will be shown, from this menu we have to change the setting "Use bitmap fonts for complex scripts". Default selection for this setting will be No. Inorder to read Tamil pages, change this setting to Yes. Now click save and go back to the Opera Mini home to open any tamil page and see. Note: Enabling this option will result in higher data rate. 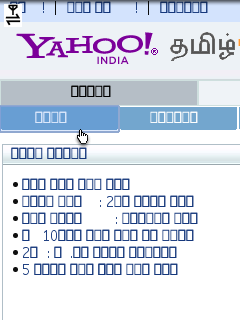 For example, yahoo tamil site size is 129KB with setting and it was only 32KB before enabling the setting. If you are upgrading Opera mini to a higher version, then this setting has to be done again. Last saturday, I went for a Walk In for experienced professionals at CISCO, Marathahlli, Bangalore. Call was for Embedded C/RTOS professionals having experience of 3 to 7 years. They asked us to wait for some more people to come, and then called for the test. Test was for 1hour and there was around 10 questions. All questions were C-programs/C snippets which contains one or two logical errors. We were instructed to mark the error on the same sheet and describe the mistake. Programms were based on data structures, string handling, arrays, dynamic memmory allocation etc which includes lot of pointer operations, function call and return. There was one program based on unix function calls like open, read, write which I was not familiar. They told us that, I we are short listed, then they will be informing in one week, because the openings are in Chennai location. So the paper will be sent to Chennai location where it will be evaluated. Thanks for showing interests in pursuing job opportunities with Cisco Systems in Chennai. Land Mark Shantinagar and Behind Hockey Stadium. Please acknowledge this mail as your confirmation. Yesterday(7 May 2011), I attented the interview.. It was a 1:1 interview. They asked about my previous experience, but when I started explaining they showed lack of interest, since my experience was on automotive embedded domain. Then I was told to write two C-programs. I was not able to write the answer to the second question as I was not so familier with data structures, I wrote program to reverse the linked list. I was told to leave after that.. I dont have much hope that they might call.. but still awaiting for a response. I was trying to start working with ARM microcontroller for long time. I thought it will be better to buy one developement borad to start. Since it is only for hobby purpose, I did not want to invest much on the developement board, so I started searching for a cheap ARM developement board. First I searched in the local electronic markets in Pune, but I was able to find only two shops in Pune where there boards are available (Rajiv electronics and Sadashiv electronics). I enquired in these shops, but I was not able to find any boards which were cheaper than 2500(around $57) and I did not feel it is worth buying those boards. So I deced to get MINI ARM7 KIT - LPC 2148 from NSK electronics, Bangalore which is available for 1500 online. There is option for buying online, but I bought it directly from their shop when I visited Bangalore last week. There is no seperate power supply, but the USB cable can be used as power supply. 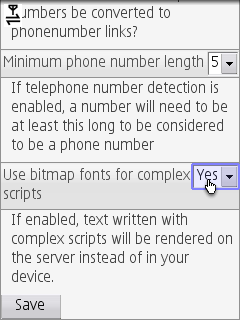 Setting up the board was very easy, Connect the serial port to computer, install and open the Philips Flash Utility(download v2.2.3 here), and set the options as shown in screenshot below. Even though the quality of the board is not up to the mark(one out of four LEDs did not work when I tried the LED blink code), this will be a cheap and good option to start with. Once I was trying to interface my old microSD card with an Atmel Atmega8 controller. First I thought of using a SD/MMC card adapter and solder the wires to the adapter. But I felt like I will not be able use the adapter for some other purpose and I will have to solder the wires again, if I want to interface another SD card. So I decided to get a SD card socket which can be attached to my circuit.But I found it difficult to get the socket in the local market, and those available in the online markets were very costly. So I constructed my own SD card socket/adapter for my circuit. These are the items which I have used for construction.